With all the tips and tricks dedicated to maintaining your system and keeping your energy costs low, it can sometimes be challenging to keep up with them all. One very simple step to remember is to monitor your thermostat. Why should you care about your thermostat? Heating and cooling your home costs about 54% of your utility bills. The more strategic you are in using and monitoring your thermostat, the more you can decrease this percentage. Adjust the temperature when you’re in and out of your home. Take note of the 3% you can save on your energy costs for adjusting air conditioning temperatures accordingly. Make sure your HVAC units are ready for every season. Not only will this make adjusting temperatures throughout the day much easier, but the newest versions come with user-friendly touch screens and even mobile applications that allow you to monitor your thermostat from the palm of your hand. You have four options of programmable thermostats to choose from. Make sure you choose the one that will best complement your lifestyle. 7-Day Programming: Program a different schedule for each day of the week. Best for people with fluctuating schedules. 5-1-1 Programming: Program three schedules – one for Monday through Friday, one for Saturday, and one for Sunday. This is best if you have a consistent schedule for weekdays and fluctuating schedules on Saturdays and Sundays. 5-2 Programming: Program two schedules – one for Monday through Friday and one for Saturday and Sunday. This is best if you have a consistent schedule during the weekdays and weekends. 1-Week Programming: Program one schedule for the entire week. Best for those that spend the majority of their time at home. Keep in mind that these schedules will need to be adjusted when the season changes. Program your thermostat to turn on 20 to 30 minutes before you come home. Lower your thermostat 60 minutes before bedtime. Increase your thermostat 30 minutes before waking up. 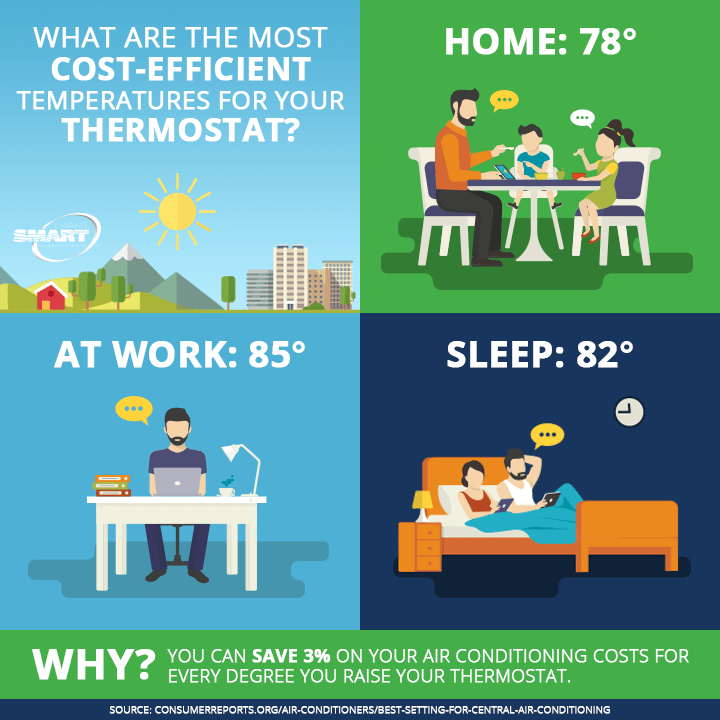 Taking the best care of your thermostat with these tips is a very efficient way to save on your energy costs. Making sure your HVAC systems are up-to-par will help you save, too. We can help with that – give us a try. Do You Have Your DUCTS in a Row? Your air ducts play an important role in your home’s air quality. However, if you’re not an HVAC technician, it may be challenging to figure out the right time to maintain them. With this handy guide, you’ll not only learn how to take care of your air ducts, but you’ll learn what they are, their importance to the HVAC world and how maintaining them can benefit your health. #1: What is an air duct? An air duct is a metal pipe that carries cold and hot air through the vents within your home. #2: Why should you care about your air ducts? Inefficient air ducts, such as those that leak, can heavily waste energy. If pollutants like mold, dust, and bacteria build up within them, they can irritate allergies, cause respiratory issues, and bring about other health concerns. Make sure your air DUCTS are in line. #3: How do you know when it’s time to maintain your air ducts? #4: How often should you clean your air ducts? #5: What does the process look like? Cleaning your air ducts is important to the cleanliness of your home and most importantly, your health. Keep them maintained by the technicians that know your air ducts best. https://iwantsmart.com/wp-content/uploads/2016/08/shutterstock_65790655.jpg 665 1000 SMART https://iwantsmart.com/wp-content/uploads/2019/02/SMARTlogo-nav2019-300x146.png SMART2016-08-11 21:53:052016-08-11 21:53:05Do You Have Your DUCTS in a Row?